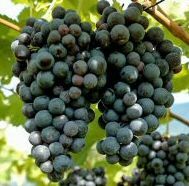 Regent (Vitis vinifera 'Regent') is an extremely versatile grape variety, producing very large blue-black coloured grapes. These are noted for their sweet refreshing flavour which will mature to a true black in the best of summers. Regent also produces a real colour show in autumn, when its leaves produce beautiful red colours. Excellent choice for moderate acidity wine making with high fruit yields and higher alcohol content. Good resistance against the most significant fungus attacks such as downy mildew.